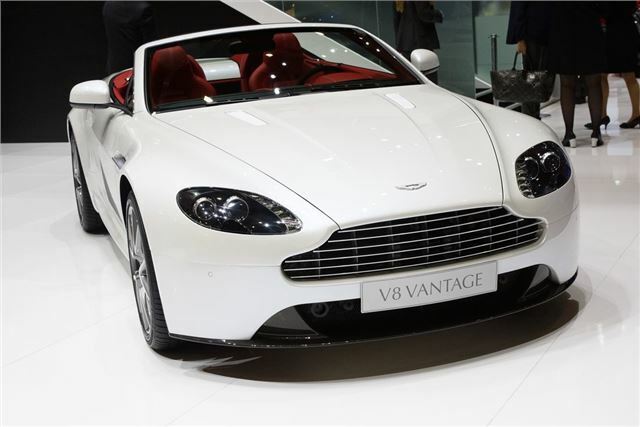 Aston Martin has improved the Vantage range for 2012 with enhancements designed to add to the 'dynamic feel and style' of the model. The new coupe and convertible versions were officially launched at the 2012 Geneva Motor Show and prices have been actually been reduced with the V8 Coupe now costing £84,995 - a cut of almost £6000. The updates are the most significant since the range was revised in 2008 and while the 'entry' level V8 Vantage has the same 426PS 4.7-litre engine as before, it's now available with a new six-speed Sportshift automated manual gearbox as an option. The chassis has also been worked on with quicker steering, larger brakes and wider tyres. The new braking system includes Hill Start Assist (HSA) for more control on steep inclines. The V8 Vantage also gets styling tweaks inspired by the Vantage S and N400 limited edition. There's a lower bumper with an aerodynamic splitter that has a larger air intake that feeds the engine and front brakes. Meanwhile the Vantage S is now priced at £99,995 - a cut of £2,500 over the previous list price. It retains the same 436PS V8 engine and gets the Sportshift II seven-speed automated manual transmission as standard along with a sports exhaust system. Inside the Vantage S there is carbon fibre detailing and a fully integrated sat nav system developed with Garmin along with Bluetooth and cruise control. Production of the V12 Vantage continues unchanged with the same 6.0-litre V12 engine producing 517PS and and 570Nm which gives it a 0-62mph time of 4.2 seconds. Later in 2012 the V12 Zagato will be introduced. The pinnacle of the Vantage range, the new Zagato is on sale at a mere £330,000.